My Ukrainian Borscht is hearty, healthy and so good! Picky kids approved recipe that feeds the family 2-3 days in a row. It’s a comfort soup I never get bored of eating. Click HERE to PIN IT this recipe! If you hear someone saying they make an authentic Borsch recipe, don’t believe that person and walk away. Well, I’m kidding of course, but do you know that every respectable Ukrainian homemaker will claim her Borsch is authentic? It always makes me laugh when I read cooking community boards where all these ladies fight till they prove their Borscht is the most authentic one. Here, I’m not going to claim my Borscht is authentic. Because the truth is – no one knows a truly authentic recipe. 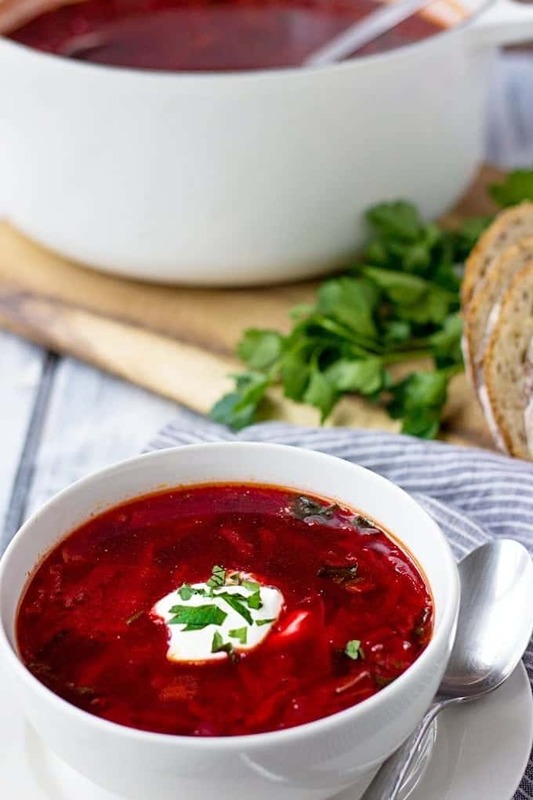 There are certain ingredients that you must absolutely use in order to call it Borscht, but other than that every homemaker has her own spin on this hearty and delicious classic. Is my Borsch recipe a delicious one? You betcha. In fact, this is seriously the only recipe you need. Believe me if I say I tried countless of Borsch recipes and I many of these recipes at home. But the version that I’m giving you today is my favorite. I’ve been making it for years and I never get bored of eating it. It’s hearty, full of veggies, healthy and so so good. My super picky 5 year old is one of the biggest fans of my Borscht. She even requests for me to make it which surprises me most since she rarely orders something except for pasta with the pesto sauce. 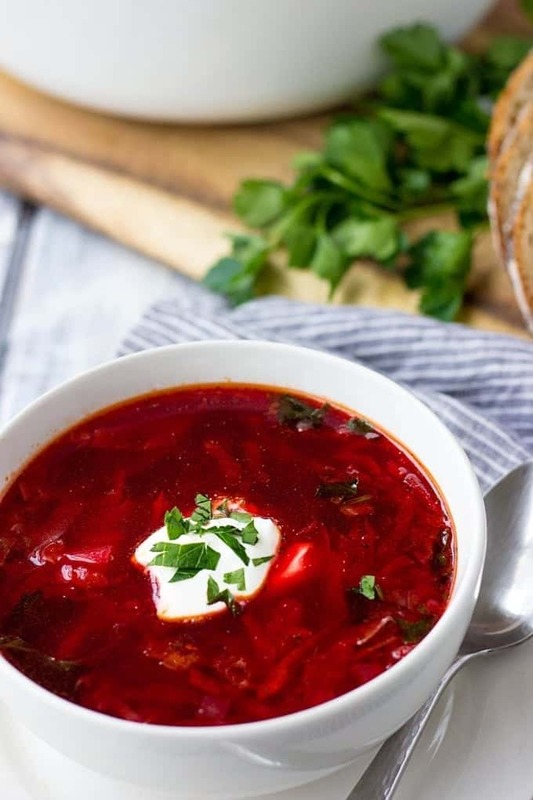 Now, here are a few things worth mentioning about Ukrainian Borscht Soup. First, I strongly recommend you making a big pot of it. It is so good, you want to eat today, tomorrow and perhaps even the day after tomorrow. A good, heavy-duty Dutch Oven is your friend. In Ukraine, homemakers usually make huge pot of Borsch and eat it the whole week and I’m not kidding. Second, Borscht always – always tastes even better on the second day. Since it has many ingredients, over night they meld and merry together to create an ultimate Ukrainian comfort dish, full of flavor and taste. 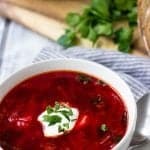 That’s the truth my friend, which brings us to the first point – make a big pot of it so that you can enjoy this flavorful Ukrainian Borsch or Cabbage Borscht with Smetana (sour cream in Ukrainian) several days in a row. 1. Although, most of the Borscht recipes call for beef or chicken broth, I’ve been really enjoying making a vegetarian Borscht. I usually start with making my own vegetable broth which takes me no more than 30 minutes and use it as a base for my recipe. If you make your own chicken or beef broth, you can shred the cooked meat and add it into Borscht as well. 2. What makes Ukrainian Borscht Soup a true feast is the addition of Salo (cured pork fat) mixed with raw garlic. If you’ve ever tried Salo and you like it, go ahead and add it at the end of the preparation process. You’ll love the additional flavor and heartiness of this Borscht. 3. You can also make Borscht in your crockpot. Here’s my Slow-Cooker Borscht recipe that I make very often. It’s a tad different from this recipe but still very delicious. Russian Meat Soup (Solyanka) – tradition Russian soup with chicken, bacon, salami and sausage. Russian Pozharsky Cutlets – you’ll never try chicken cutlets cuter than these! Georgian Khachapuri – cheese filled flatbread that is a staple in Georgian cuisine. Georgian Satsivi (Chicken In A Walut-Garlic Sauce) – dairy free chicken dish with the best sauce in the world. If you like this recipe for Beet Borscht, please share it on Pinterest. I’d greatly appreciate this! Recipe Video Above. 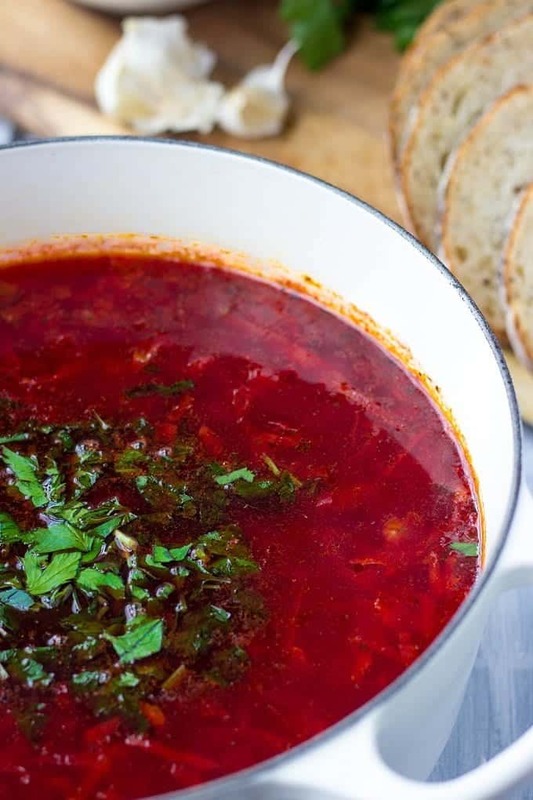 Healthy and delicious, this classic Ukrainian Borscht soup is packed with vegetables. Perfect for the colder weather. Click on the highlighted links to purchase the ingredients. Using a paper towel peel the skin and shred the beets on a large hole grater. Meanwhile, heat olive oil in a large Dutch Oven and over medium heat. Add onion and carrot and cook stirring occasionally until softened, about 5-7 minutes. Add cabbage, sugar, vinegar, tomato sauce and 1 cup of chicken broth. Reduce the heat to simmer, cover with a lid and cook for 20 minutes. Increase heat to medium, add cubed potatoes and the remaining 7 cups of chicken broth. Stir, bring to a boil and cook for 10 minutes. Add shredded beets, kidney beans with all their liquid, bay leaf, salt and pepper. Cook until potatoes are soft, about 5 more minutes. Turn off the heat, adjust the seasoning and add garlic pushed through a garlic press and parsley. Cooking beets. You can also roast the beets. Preheat the oven to 400 F. Wrap each beet in a foil and roast until tender when pierced with a knife, about 50-60 minutes, depending on a size. Alternatively, If you own a slow cooker with a steam function, you can fill the bowl of a slow cooker with 2 cups of water, place the steaming rack inside and steam beets for 15 minutes or until tender. I’ve not tried this before! But the flavors sound amazing. I have never tried Borsch before but looks so colorful and a great soup to offer during this time of the year. when warmer soups are a must have. I will include this recipe in my list to make at home. I am always looking for fun ethnic dishes to try. This one will be getting pinned for later. Don’t delay making it! It is very good, and you always can twist/develop/change recipe, adjusting it to your taste/mood/ingredients-on-hand. I’ve seen this soup before and thought it was all beets. Now that I can see all the different flavors, I think I’m going to give it a try! It’s so true that there are just certain recipes that everyone has their own way of making it, and everyone seems to be convinced that their way is the only way! 🙂 I agree with you – what matters in the end is that you and your family love it, and if your picky kiddo eats up something this healthy, well, that is a win no matter what!! My borsch recipe is an attempt to replicate my mother’s version. But each of the above seems to have some version of mama’s. On a recent trip to Ukraine, our welcome dinner included a wonderful homemade borsch made by my cousin. I asked her about “the best borsch recipe”and the entire table erupts in laughter. “There are as many borsch recipes as there are Ukrainians,” she replied. So there you go, if it tastes good, you got the right recipe. One comment I totally agree with is, Borsch always tastes better the next day……mmmmmm! Ha-ha, that’s right. There are so many borsch recipes, it’s hard to find the best version of it. Both of my grandmas and my mom have their own borsch recipe and all of those recipes taste amazing. i was curious when i saw your post. this is very different from what i grew up with! my Ukrianian grandma, Tekla Shwaykoski, started with pork ribs and an onion to make a stock. after the ribs were tender, she added the raw beets that were cut in match strips. when those were tender, the soup was thickened with flour mixed with heavy cream, then seasoned with vinegar and dill. the meat was reserved for my grandfather– if we got a bit, that was a bonus. my 94 year old mom and i made this for family last weekend along with kielbasa and saurkraut and homemade pierogies with onions steeped in butter and sour cream. horseradish for the kielbasa, of course! I used to make Borsch similar to how your grandma made it. It’s delicious that way. Both of my grandmas have different Borsch recipes and my mom makes it differently too. And it’s an interesting thing about Borsch. Regardless of the way you make, it will still taste great. I’ve tried so many different Borsch recipes and all of them very good. Omg! I love borsch and I make it pretty much the same except instead of fresh cabbage and vinegar I use half fresh and half sour crout and I put it in the very end because I don’t like it too soft. Thanks for the recipe. I’ll make it today ? Hi Anna! I love souerkrout and often make it during cold winter months. I’m sure Borsch will be delicious with sauerkraut in it. Wow. This was amazing. We had it with potato latkes on the side and you were really right. We will be eating this for some days. Utterly delicious and a big hit with my two vegetarians (used veggie stock). I’m so glad you liked my Borsch recipe. Potato latkes on the side seem like a great addition. Sometimes I also use vegetarian stock and Borsch still tastes amazing. Walking away as my borsh is better, ha… Just kidding, of course!!! 🙂 Yes, yes, yes — everybody has their own version. However, I grew up in Ukraine and can assure anybody who reads this blog that the list of ingredients is very authentic. Having made borsh since middle school, I can tell from the ingredients and process that you will get a very yummy result. Thank you, Iryna, for sharing your delicious version. I will definitely give it a try — and soon! Thank you for the kind words Tatyana! Indeed, all people I know have their own twist on this recipe and their borsch always tastes great too. I know, for us, Ukrainians a name “borsch” sounds unnatural, but I figured that’s how people search it on Google, that’s why I named it borsch. You actually spelled it like I would! 🙂 Borsch sounds how we would pronounce it. People who don’t know how to pronounce, usually add a “t” to the end, which does not belong there. 🙂 Keep up the good work! Oh, we’re definitely not adding “t” to the end:) That would be too much.